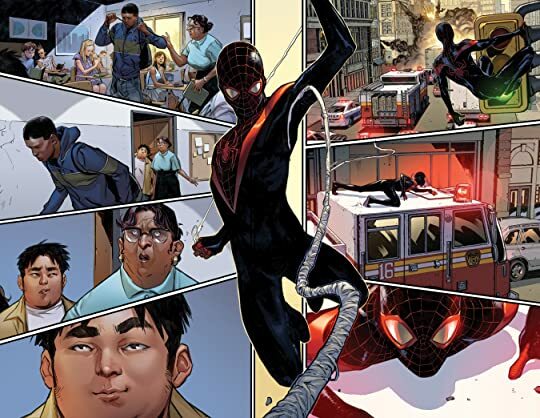 Following Secret Wars Miles Morales, his friends, and family have joined the main Marvel Universe. An even bigger surprise is Miles' Mom is alive again. Now Miles is once again attempting to balance his superhero work with his school work. Unfortunately his school work isn't fairing so well at the moment. 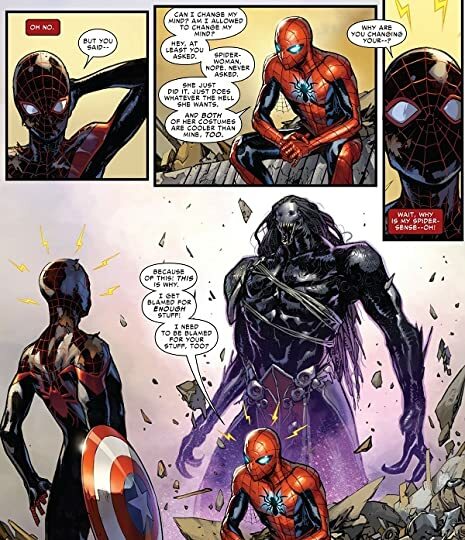 Post Secret Wars Miles Morales' existence is anything but clear. His Mom's alive again which is a massive plus. No one seems to have any memory of the Ultimate Universe. Even Peter Parker who met Miles in Spider-Men has no recollection of the other world where Miles and his loved ones are from. Miles' father still knows he's Spider-Man, but there is no longer any anger over that point. Prowler is alive and no word if he's Miles' uncle or not in this world. It's frustratingly confusing because the story is saying, Forget what you learned before...well except for the characters...um well that's not entirely true because some of them have changed and one came back to life. Don't be concerned that no one remembers Miles' past even him. The storyline itself is the standard school aged hero. Basically it's I have to save the world, but I have to do my homework too. I imagine it speaks to kids, unfortunately I'm way past that point in my life so reading about balancing school and being a superhero holds little interest to me at this point. I do like Miles, but the comic's focus is significantly different from my own. All in all Spider-Man: Miles Morales vol. 1 is a good title, but I'm not sure it's what I'm looking for anymore.